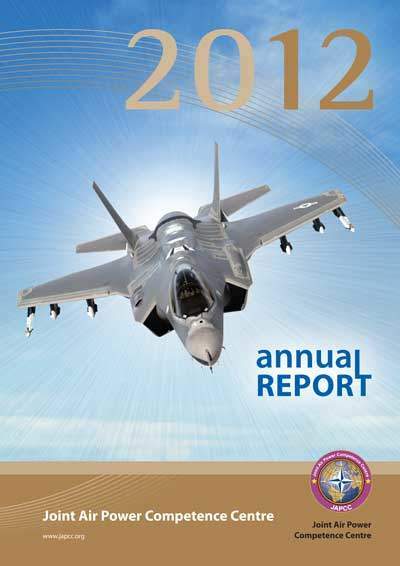 2012 could well be entitled ‘The Year of Challenges’ for the Joint Air Power Competence Centre ­(JAPCC). The JAPCC faced some difficulties in accomplishing its mission to be the Air and Space Power Transfor­mation Agent for the Alliance and its Sponsoring Nations. Despite these challenges, the Centre of Excellence (CoE) finalised a number of projects and continued its strong Air and Space (A&S) Power Subject Matter Expert (SME) representation across NATO as members of committees, panels and working groups. The two major challenges that faced the JAPCC during 2012 were manning and mission accomplishment. On the manning front, JAPCC lost nearly 10 % of its personnel, as well as sustaining months-long gaps in key SME and leadership positions. The organisation also experienced significant turbulence as it changed 75 % of its leadership (nine of its twelve key positions) during the course of the year. A third of the SMEs were also exchanged during 2012. Significant and damaging to JAPCC’s capability were the withdrawal of manpower and money from several Sponsoring Nations, a trend that began in 2010 and continued throughout 2012. The second major challenge was my predecessor’s task to the JAPCC in March 2012, to take a critical look at ­itself and assess whether the organisation was truly ­relevant and successfully accomplishing its mission. Much work was conducted first to understand the state of the organisation and then to take concrete ­actions to move the organisation back onto the correct vector. The JAPCC began the hard task of transforming itself into an organisation that is aware, responsive and capable of adapting to meet the ever-changing needs of NATO and the Alliance. In spite of these and other challenges, the JAPCC continued to provide work of high quality in several areas. Of note were JAPCC SMEs’ work in the areas of Force Protection, Space, Joint Intelligence Surveillance and Reconnaissance, Leadership Development, Operational Level Air Planning and Helicopter Operations. The JAPCC produced and delivered eight major projects including the 2012 JAPCC Annual Conference. JAPCC SMEs acti­vely participated in over 70 NATO committees, panels and working groups as well as serving as Chairmen of three NATO Working Groups. This 2012 Annual Report provides much more detail on JAPCC projects and acti­vities over the course of the year. This brief overview cannot do justice to the hard work and dedicated efforts of the men and women of the Joint Air Power Competence Centre. Therefore, I strongly encourage you to read the report more closely in order to gain a fuller and deeper understanding and appreciation of the contributions made by the JAPCC to NATO and the Alliance during 2012.